Fall is the time of year to turn your attention from the outdoors to the indoors. This read will give some ideas about how to increase the cozy level of your interior! Decide what particular focal points you would like to emphasize. Do this instead of sprinkling fall décor throughout your other décor. Having several different fall focal points throughout the home is certainly fine. We suggest decorating our mantel, dining room table, book cases and entry ways. Choosing focal points to decorate within a room, allows to showcase fall décor and decorations. When selecting items to decorate with, consider using natural items. Real pumpkins and gourds are a wonderful way to add bright colors from nature. There are many different ways you can treat these items easily, in order to keep them from rotting during the season. We suggest finding a method that is right for you via the internet. Type in a simple search like “preserving pumpkins during the fall season”. Chances are there will be several different options for you, using items that you already have in your pantry! White candles are one of our favorite ways to warm up a space for fall. Candles also provide a warm accent light to highlight seasonal fall vignettes. Of course you can use whatever kind of candles, but we love white. White candles provide a classic crisp look to any seasonal decorating. Keep white candles on hand year round for all types of seasonal decorating. Gnarly branches are a neat way to add a natural fall touch to any area. Use these in floral arrangements or incorporate them into table setting décor. If you decide to gather branches, instead of buying them, make sure to spray some cleaner on them. This will kill any insects that may be living on the branches. Do this before bringing branches inside. We also like adding a little moss to the base of indoor potted plants. This adds a fall whimsy that makes you think of crisp, foggy fall mornings. Get creative and select items that are warm and brightly colored for your seasonal fall vignette! Finally! We have reached a time in fashion when sweatshirts are considered appropriate for nearly all levels of dress. Gone are the days when they were strictly for running or cleaning the house. It’s now common to see them with pants, high heels, even sequin skirts. The main trick to making it work is to use a good sweatshirt. Either something new or something fashion forward (these are now really easy to find.) Then, you just start mixing and matching the same way that you would if it were any other top. Here are our top suggestions! Classic heather grey sweatshirt, black leather skirt, sneakers. Dark grey classic sweatshirt, over top of white button up with just shirt tails peeking out at the bottom, black skinny jeans, large leopard print scarf, tan leather bag, neutral flats. Black graphic sweatshirt, black distressed skinny jeans, oversized black leather bag, black booties. Slim fitting black sweatshirt with white graphic print, chunky chain necklace at neckline of sweatshirt, red/black/grey plaid pencil skirt, basic black pumps. Heather grey sweatshirt with pink and black graphic design, cream colored chiffon mini flared skirt, black clutch, chunky necklace, black and brown wedges. Burgundy button up shirt under grey sweatshirt, cropped denim jacket, burgundy/cream/navy large plaid scarf, black skinny jeans, black leather bag, leopard print slide on sneakers. Bold black graphic sweatshirt, lightly distressed whisker washed blue jeans rolled at the ankle, pop color bag, two-tone stilettos in colors that coordinate with sweatshirt. Charcoal sweatshirt with white graphic lettering, over top of red/black plaid button up shirt with just the shirttails showing, a watch, distressed blue jeans rolled at the ankles, chunky necklace, mustard yellow bag, brown suede mule boots. Basic sweatshirt in a neutral color, slim fit blue jeans, pop color watch, pop color sneakers that match the watch. Thin grey sweatshirt with sleeves cuffed just below the elbows, tucked into long floral flare skirt, black or neutral chunky heel sandals. When it comes to making smoothies the rules of the game have changed a bit. For decades we’ve whipped them up in our standard kitchen blenders. The taste was great but the effort and ingredients were often excessive. How many blenders half full of smoothie have you put in the fridge only to forget about it and waste the ingredients? Probably quite a few, and fresh foods aren’t cheap. No need to fret over your money going down the drain anymore. Compact, single serve smoothie machines are the biggest trend in kitchen appliances these days and they solve the problem well. However, most of the smoothie recipes are still portioned for a large batch. So, we created these tasty treats that are excellent options for healthful nutrition, without being bland, boring, or just plain yuck! You won’t need to put these in the fridge for later, they’ll be gone in a flash. Taking care of skin sure is a chore! It requires daily attention regardless of our hectic schedules. The face is particularly demanding because it is more delicate, especially around eyes and lips. Full service facials at the spa work wonders, but who has the time or money for that? Achieve the same effect with these two DIY masks that require nothing more than items found in your kitchen! This mask packs a punch because it is both a scrub and a mask. Cut up the peaches into small pieces and use a fork to mash theM completely. Add olive oil and a small handful of brown sugar. Mix thoroughly and mash all ingredients together, without losing the graininess of the brown sugar. The Vitamin C in the peaches acts as a skin brightener, the olive oil is a deep moisturizer, and the brown sugar will exfoliate dead skin. Layer the mask evenly on your face and leave it on for ten minutes. Then gently massage your face so that the brown sugar crystals can do their job. Rinse well and take a look in the mirror. You’ll see a cleaner, brighter, fresher face! Slice the tomato into medium width slices that you can hold between your fingers. Start by gently rubbing the tomato directly on your skin in a circular motion. Your face will feel instantly refreshed. But you’re not done yet! Mix together equal parts lemon juice and baking soda. You just need enough to cover your face. Notice how this mask bubbles – fun! Rub the mixture into the skin gently and leave it on for 10-15 minutes. All three ingredients activate the skins natural processes and “wake it up.” The result is skin that looks alive and fresh. Our living rooms are often more than just a place to watch television and entertain guests. For many of us, we do most of our living at home in the living room. These rooms become a media room, home office, dining room and sometimes even a guest room. While we might not admit it, many Americans eat dinner while watching TV in the living room or family room. The design trend to open concept spaces that incorporate kitchen, dining and living spaces means more and more of us are spending most of our time at home in one room. Creating a décor that can work with all these different activities is key. Furniture arrangements, flooring and materials should all be selected to stand up to the heavy use and high traffic of today’s living rooms. Sectional sofas allow seating for many in a single piece of furniture. Coffee tables that are also ottomans can multi-task as game tables, dining tables and extra seating. Wireless routers and laptops mean we can telecommute from any room in the home. More than one family member can be online at a time… so the sofa can become a home office, socializing center and homework space. Living room flooring should be durable to stand up to all the demands we place on the room. Stain resistant and stain repellant options are key for carpets in high traffic areas. Hardwoods and other hard surfaces are durable but it is nice to have something softer for impromptu lounging on the floor. Selecting the perfect floor with all of these challenges in mind can be a daunting task. The team at Ambassador Floor is always ready to answer any questions you might have. Tell us if we can help! In order to survive the last minute dash to the grocery store and the frantic meal planning, table setting, wine choosing moments that sometimes define our Thanksgiving holidays, why not sit down now and plan your meal. Then perhaps you can actually enjoy the cooking and still have time to talk to your friends and family. Start with how many people you will have over for dinner. Are you going to have everyone bring a dish or are you going to cook everything yourself? What time are you going to serve your meal? This will determine how early you have to get up, what time you need to start your turkey and how much you can possibly get done the night before. Are you going to have turkey, ham or something untraditional? Order your ham and turkey now from your butcher. Possibly you have an old family recipe that you always use, but if not scour food magazines and online sites for different preparations. One note of caution, please don’t try anything too complicated. You don’t want to try out a new recipe only to have it flop. Determine the number of sides you want to have. Do you want mashed potatoes and gravy, sweet potatoes, stuffing, Brussels sprouts, green beans and rolls? Make your list and then plan your oven time. Your turkey or ham will take up the oven so be sure your sides can be done on the stovetop or made the night before and warmed in the microwave. Make dessert the night before. If you are planning on making homemade pies, make your piecrust the day before you finish the pies. By splitting up the work you will avoid getting overwhelmed. Set the table the night before as well. Clean your main floor paying particular attention to the guest bathroom. Set out extra tables for guests to rest their drinks on. Make sure your front porch looks inviting. Now pour yourself a glass of wine and count your blessings. 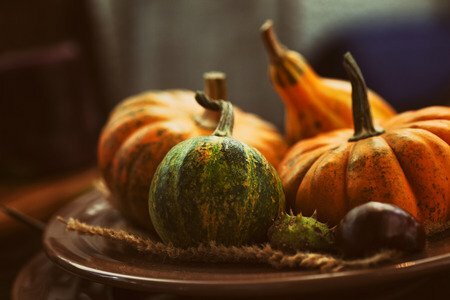 Whether you want to gather around the dining room table for a formal sit down dinner, eat one last time in the garden or huddle in front of the TV to watch a football game, entertaining in your home during this wonderful season should be a celebration of the bounty of the harvest and hard worker of the farmers who selflessly worked to bring all of those fabulous fall vegetables to your kitchen. Sweet potatoes, apples, pears, fennel, garlic and cauliflower are all great seasonal choices. For a more formal dinner roast apples and onions with pork for a main dish. A cauliflower gratin is a great side. Poach pears in sweet wine for dessert. For a more informal dinner for a tailgate make ham and pear sandwiches. Bake up some sweet potato fries for a side and make caramel apples for dessert. You can also make roasted pears with walnuts and blue cheese or a frisee salad with pears and hazelnuts. To drink you can’t go wrong with spiced apple cider. Spike it with champagne for the adults. Since weather during this season can be unpredictable, if you plan to eat outside make sure you have a backup plan if things go south. To make your table fall perfect, choose a fall color and use it everywhere. Get grocery store flowers; add feathers and stalks of dried wheat for a themed centerpiece. Hurricane lanterns are another nice touch. Make the entrance to your home look ready for fall by adding gourds, pumpkins, corn stalks or wreaths of fall colored leaves. But most of all enjoy your time with your friends and family as you entertain. There is nothing as satisfying as a good meal with good friends. You can feel the crispness in the air; fall is on the way and with it comes – back to school. Well, some parents anxiously anticipate getting back to a routine; others dread the end of long lazy summer days at home with no early morning alarm clocks and only driving to fun activities like the swimming pool or the amusement park. With the beginning of the school year, families are once again ruled by start and end times, sport schedules and homework. There are a few things you can do to make the transition from summer fun to getting back in the classroom a bit easier on everyone. First, create a family calendar. Keep this calendar in a central spot, like the kitchen. Older students can be responsible for posting their own events, but you’ll have to record things for your younger kiddos – like when it’s their turn to bring a snack, or when it’s pajama day. Stock up on foods that your kids will actually eat. Do a grocery run each weekend. Cut up fruits and veggies. Stock the pantry with nutritious snacks. Then, teach your kids how to make their own lunches. If they make them the night before your mornings will go much smoother. Set your alarm clock for 15 minutes earlier than you think you need to get up. This will allow you time for the little things that can go wrong in the morning. Have your kids set out their clothes the night before. In fact, have them shower the night before. And be sure that they have their backpacks and all their homework ready and waiting by the front door. With a little advance planning you can make the transition easy on the entire family. And remember as you are driving them to school or to the bus stop, it’s a great time to talk about goals for the coming school year. How are you spending the holidays? We hope you’re surrounded with people you care about and are enjoying the season! Snowflakes: Create a craft table in the kitchen and cut out snowflakes with the kids that you hang around the house. They can decorate them however they want; like adding glitter or drawing pictures. Sledding: Make it a family affair and find a hill nearby that you can go sledding down. Build a snowman: Grab an old scarf, a carrot, and some coal. If you don’t have coal lying around the house, you can try using spare buttons or use Oreo cookies. Craft a snowman: If you can’t go outside and build a snowman from snow, make it into a craft for the kids. They can cut out the snowman and accessories to create their very own, special snowman! Snow fort: If you’re outside, help the kids make their very own snow fort and/or house. If you’re inside, make a fort with blankets and chairs. You can read holiday stories and they can play with their new toys inside.